Rescuers in the southern Taiwanese city of Tainan pulled out 221 people and three dead from a residential high-rise complex that collapsed when a shallow 6.4-magnitude earthquake struck before dawn Saturday, leaving still others trapped inside. Firefighters and soldiers scrambled with ladders, cranes and other equipment to the building that folded like an accordion in a pile of rubble and twisted metal and extracted dazed survivors. The emergency response center told The Associated Press that three people were killed, including a 10-day-old infant, a 55-year-old woman and a 50-year-old man. Taiwan's official news agency said the infant and the man were pulled out of a 17-story Wei Guan residential building and that both were later declared dead. The agency said 256 people were believed to have been living in 92 households. 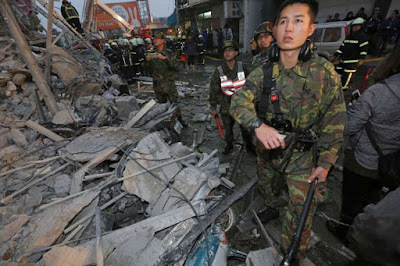 Dozens more people have been rescued or safely evacuated from a market and a seven-floor building that was badly damaged, the Central News Agency reported. A bank building also careened, but no injuries were reported, it said. Most people were caught asleep when temblor struck about 4 a.m. local time (2000 GMT Friday). It was located some 22 miles (36 kilometers) southeast of Yujing, and struck about 6 miles (10 kilometers) underground, according to the U.S. Geological Survey. As dawn broke, live Taiwanese TV showed survivors being brought gingerly from the high-rise, including an elderly woman in a neck brace and others wrapped in blankets. The trappings of daily life — a partially crushed air conditioner, pieces of a metal balcony, windows — lay twisted in rubble. People with their arms around firefighters were being helped from the building, and cranes were being used to search darkened parts of the structure for survivors. Newscasters said other areas of the city were still being canvassed for possible damage. The Taiwanese news website ET Today reported that a mother and a daughter were among the survivors pulled from the Wei Guan building and that the girl drank her urine while waiting for rescue, which came sooner than expected. Residents in mainland China also reported that the tremor was felt there. However, a magnitude-7.6 earthquake in central Taiwan in 1999 killed more than 2,300 people.